The Dayton Theatre Guild opened with Outward Bound at the Dayton Art Institute in late 1945 and has staged live theatre every year since, with more than 400 productions to date. The Guild has a tradition of producing seldom-seen plays, as well as bringing in contemporary shows and area premieres, without forgetting the classics. Its goal is to produce good plays done well, utilizing all-volunteer casts, crews and administration. Participation is open to anyone with a passion for theatre, regardless of prior experience. Want to know what’s going on in Dayton? 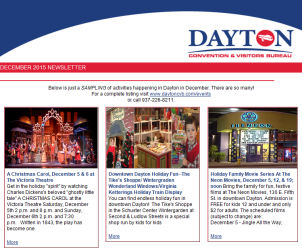 Looking to keep up with the latest Dayton, Ohio news? Sign up for our E-Newsletter!